These high-performance single-speaker systems provide two channels of L/R sound outdoors. Their Dual-Directional Soundfield™ — two tweeters, each offset at a 30° angle—and twin voice coil bass/midrange driver ensure extremely wide dispersion, a particularly important consideration outdoors where there are no walls or ceiling to contain sound. Rock Monitors are ideal in small outdoor areas less suited to a stereo pair of speakers or where a single speaker is preferred. Complete 5.1 speaker system including powered subwoofer. When size and sound matter, this affordable audiophile collection delivers blockbuster solutions like Cinema. Cinema speakers are designed for smaller spaces but despite their compact size, they deliver a blockbuster music and home theater experience. While it's true, there are tiny satellite speakers aided by small subwoofers that can be "hidden" in many living spaces, when it comes to great audiophile sound these systems had never delivered... until Cinema. 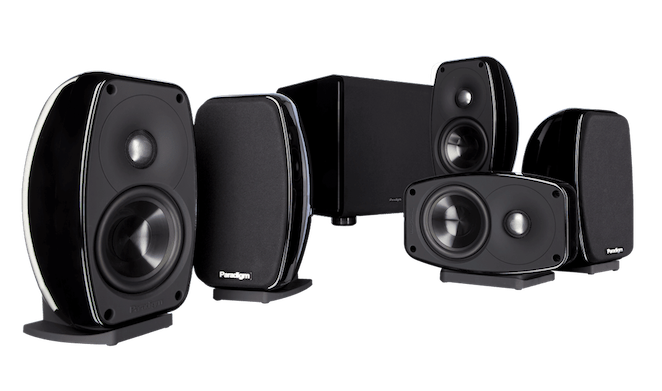 For years now, Paradigm award-winning Cinema speakers have been delivering a seamless music and home theater soundstage that brings movies to life and makes music sound "live." Rumour has it that with this new generation of Cinema speakers, the sound may be even better than the movie. "PARADIGM 100 CT AND CINEMA SUB LOUDSPEAKER REVIEWVoices were clean and uncoloured, even when Hollywood's finest are shouting, and the sheer size of the sound belies the size of the boxes. This really is a system for someone who craves a big sound but wants to avoid room-dominating speakers... Paradigm's 100CT speakers, and the subwoofer that goes with them, form a bit of a wonder package. -- Adam Rayner , Home Cinema Choice"